This photo looks north, with Foothill Boulevard (Route 66) running east and west in the foreground. That’s the Virginia Dare Winery in the foreground and nothin’ but agriculture and mountains in the background. 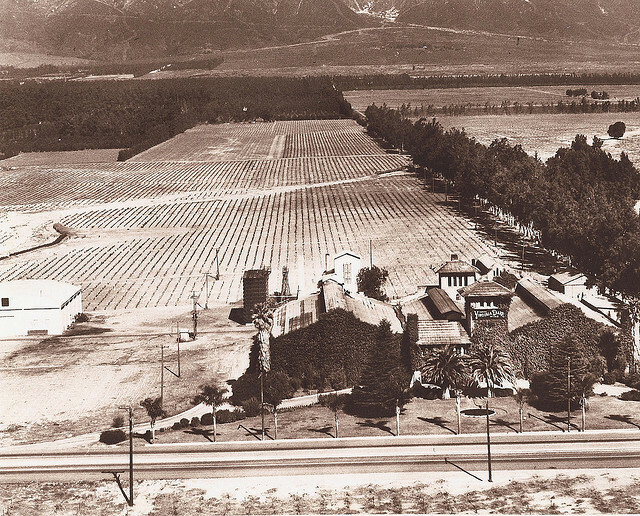 Reader James Edwards emailed me the photo after seeing the 1934 and ’46 photos of Upland on this blog. Some of the above property is now the Virginia Dare Winery Center, an office park that fronts Haven Avenue. I remember riding by as my grampa drove us along Rt 66 in the 40s. He usually stopped and we all had a look out the windows of our ’37 Dodge. I remember it as a derelict in the 70s. It’s good that some of the dramatic configuration was preserved. Back in the early 1970’s we use to go rabbit hunting, it was the thing to do back then, in my 1959 VW.